Vision of Humanity Map displaying the results of Vision of Humanity’s Global Peace Index 2016. For everyone who feels like the world is going to hell, and has been for some time, the results of this year’s Global Peace Index can certainly provide grist for the mill. Each year for the last ten years, the Institute for Economics & Peace, an Australian NGO, has produced the Global Peace Index. This systematic investigation uses data from sources like The World Bank and the United Nations to analyze 23 qualitative and quantitative indicators, primarily based around safety within a given state, level of domestic and international conflict, and degree of militarization. In analyzing all this information across 163 independent states and territories covering 99.7 percent of the world’s population, the Global Peace Index creates what is perhaps the most widely cited and comprehensive worldwide ranking of peacefulness. And this year’s results are rather dispiriting. First and foremost, the latest findings reveal a continuation of two major ten-year trends: world peace overall is declining, and the gap between the least and most peaceful nations is widening. More specifically, when compared with last year’s results, 81 countries became more peaceful, while 79 became less peaceful. But those two groups did not offset each other because the decreases were significantly larger than the increases. 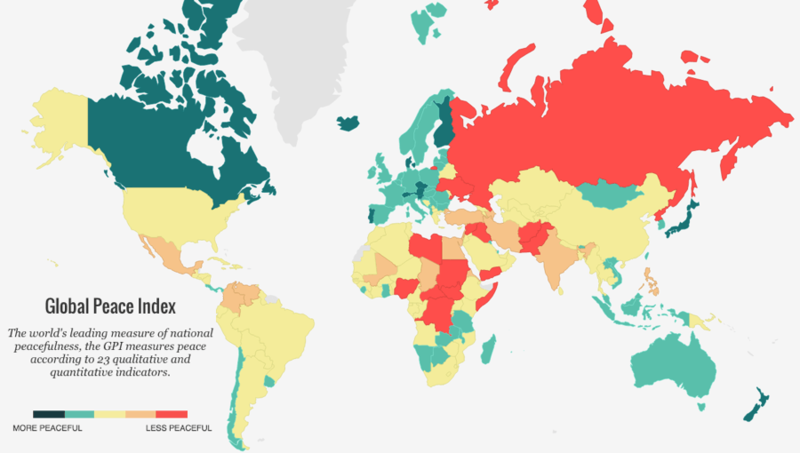 Although many countries (particularly in Europe, the world’s most peaceful region) now sit at all-time highs in terms of peacefulness, most of the Middle East and north and central Africa has deteriorated so badly that the global average is down (the five least peaceful nations, in order, are: Syria, South Sudan, Iraq, Afghanistan, and Somalia). What’s chiefly fueling this deterioration — in the Middle East and Africa specifically but certainly across the world at large as well — is no surprise: terrorism. With an 80 percent increase from last year, the worldwide level of terrorism has now reached an all-time high. Over the last year, the number of countries with terrorist attacks causing more than 500 deaths doubled, and only 69 countries worldwide did not record a terrorist incident. Beyond terrorism, battle deaths in conflict are the highest they’ve been in 25 years, and the number of refugees is the highest it’s been in 60 years. Furthermore, the economic impact of this violence is staggering, no matter how you look at it: it comes in at a total cost of $13.6 trillion, equaling 13.3 percent of the entire world economy — or $1,876 for every person on Earth. All this violence has left us with just 11 nations landing in the Global Peace Index’s top tier denoting “very high” peacefulness. The top five most peaceful nations, in order, are: Iceland, Denmark, Austria, New Zealand, and Portugal. Joining these nations on the bright side, Central America and the Caribbean — widely (and justly) reviled as the worldwide leaders in homicide — actually saw the largest improvement in peacefulness of any region on Earth. And just to the north, the United States — with a slightly lower score than last year, fueled largely by a very high incarceration rate — placed near the bottom of the middle, ranking 103 out of 163.